AFC - 03/10/09 Dump Meat For a Reason! While approaching Meatout, dump meat for a reason! Meatless nutrition is sustainable on medical grounds, since it diminishes the possibility of developing colon cancer, breast cancer, prostate cancer, ulcers, kidney failure, pancreas and bladder cancer, and similar ailments. Moreover, medical doctors and nutritionists have been arguing against the consumption of red meat for years, branding it as a cause of various cardiovascular diseases and stroke. The World Health Organization (WHO) has established that in 30% of cases, it was nutrition that caused the development of cancer in the populations of various Western countries. Cancer researchers have come to the conclusion that people who avoid meat are generally less prone to cancer. While approaching Meatout, Animal Friends launched a project "Smart People do Not Eat Carcinogens." Shocking billboards and City Lights posters aim at drawing the citizens' attention to the dangers that lurk behind the consumption of animal meat, dangers that are often intentionally concealed by those who seek profit from its sales. The project also aims at doing away with various prejudices on meatless nutrition and at indicating its substantial advantages. Adopting the vegetarian nutrition, which includes grains, legumes, vegetables, and fruit, is an excellent way of preventing numerous ailments. Therefore, it is hardly surprising that large-scale studies in the UK and Germany have demonstrated that vegetarians have as much as a 40% less chance of developing certain types of cancer as opposed to carnivores. Research has shown that elevated levels of iron in blood can also cause cancer. Even though our bodies need a certain amount of iron in order to function properly, the American National Health and Nutrition Examination Survey has demonstrated that too much iron in the human body can lead to the emergence of free radicals that damage DNA, which eventually leads to cancer. In fact, daily consumption of red meat causes an iron overdose. For this reason, experts for cancer prevention recommend iron sources of vegetable origin, which guarantees an optimal intake of iron. The American Dietetic Association and Dietiticians of Canada have produced a very detailed and exhaustive study, in which they came to the conclusion that "well planned vegan and other types of vegetarian diets are appropriate for all stages of the life cycle, including during pregnancy, lactation, infancy, childhood, and adolescence." Further on, the study states that "appropriately planned vegetarian diets are healthful, nutritionally adequate, and provide health benefits in the prevention and treatment of certain diseases." The same opinion has been endorsed by the British Nutrition Foundation. More than 150,000 vegetarians live in Croatia, and this number is increasing every day. Most people shift to meatless nutrition precisely for health reasons, but there are increasingly many of those who decide to dump meat because of feeling compassionate toward animals. In these times of ecological crisis, another crucial argument for shifting to meatless nutrition comes from a UN-FAO report: the meat industry causes more global warming than all the world's traffic combined. 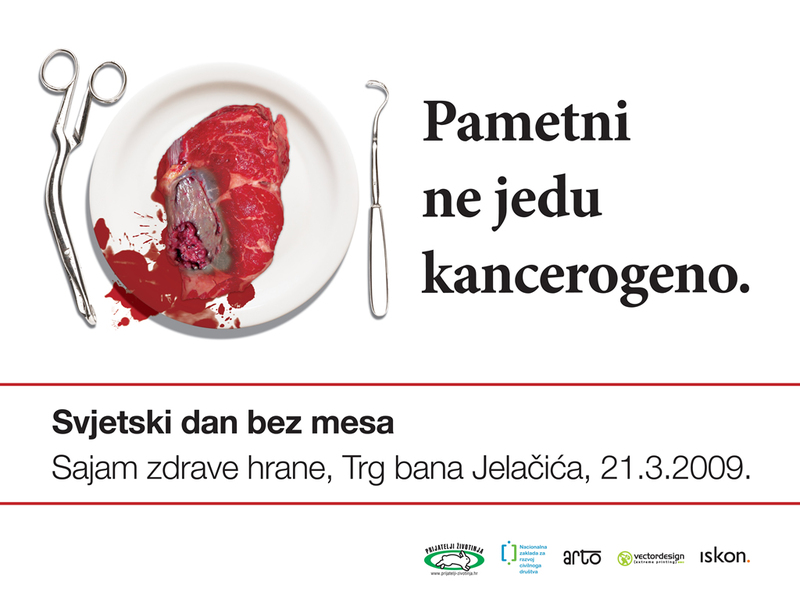 On Friday, March 20, there will be a public screening of the film Food for Life on King Tomislav Square in Zagreb, starting at 6:00 P.M. On Saturday, March 21, a Health Food Fair will take place on Ban Jelacic Square in Zagreb, organized by Animal Friends in collaboration with FARM (Farm Animal Rights Movement). Citizens are invited to get acquainted with the rich offerings of healthy, meatless foods and other products. 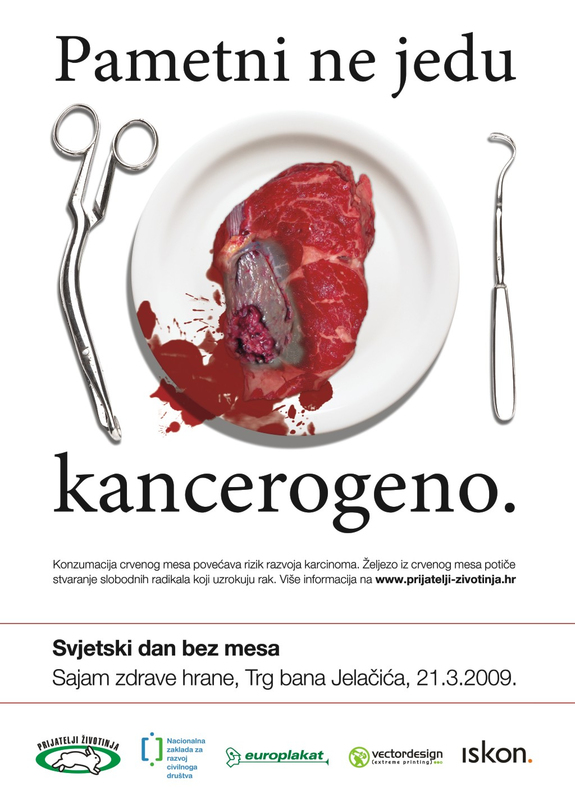 The events will start at 10:00 A.M.
Red Meat "Increases Cancer Risk"